E-Design…Is it right for you? E-design packages are something I have offered for awhile. They are a super option for those clients that would like to work with me but are at a distance. They are also a wonderful choice for those of you that want to do the work yourselves but are looking for a plan to follow, some guidance and direction. 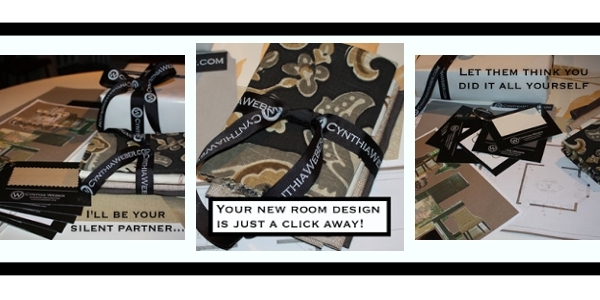 I was very happy to donate a 30 minute e-design consult as a gift for a holiday give away on a friends blog Redhead Can Decorate. The lucky winner was a great gal named Juliette. She wanted to talk about her kitchen project that had been on her mind for awhile so that’s what we did. It was great working with Juliette, I had a blast and together we came up with some great ideas for her space that will work well for her family. I was thrilled when she agreed to share her thoughts on the process with all of you. 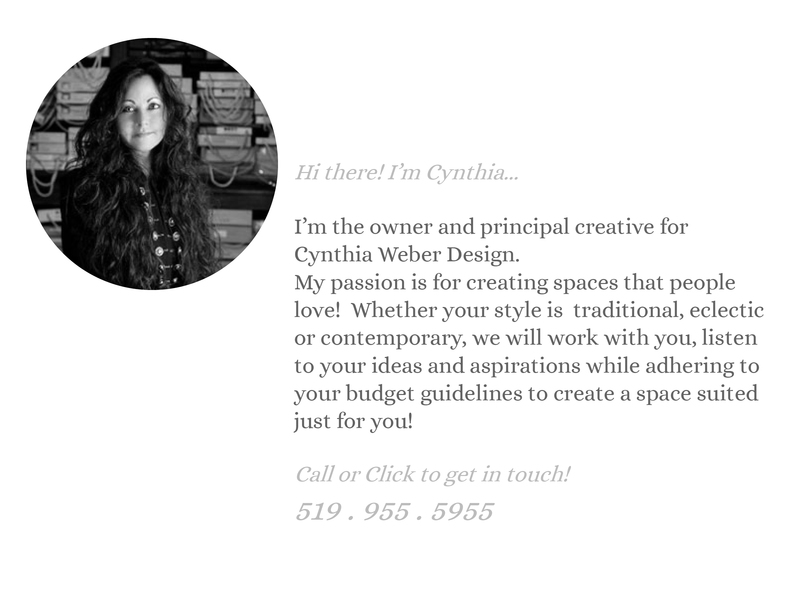 “Hi, I’m Juliette, and I won a 30 minute e-design consult with Cynthia from a blog that I follow. I was excited to have a professional’s opinion on a few issues regarding my kitchen, which has been in remodeling mode for many years. Cynthia and I connected by email and I chose to have the e-design consult done by email. I asked Cynthia whether I should paint the mahogany stained cabinets surrounding my built in refrigerator to match the new espresso cabinets or should I paint them white? My other question was whether I should move the stovetop from in front of the pass thru to where the dryer is currently. Yes, my kitchen has an exposed laundry room. I explained the previous renovations done to my kitchen and my intended future renovations. I also emailed about 16 pictures to show the layout and style of my kitchen and also the adjacent dining and living rooms. Cynthia promptly replied to my questions, concerns, and photos. She even asked me a few questions. I appreciated her sincere desire to understand my situation and concerns. And I was pleasantly surprised at her response. Cynthia gave her recommendations and attached a diagram and some beautiful example photos for reference. I love that she added the diagram and photos so I could better envision what she was describing. I like that she explained the reasons behind her ideas. She recommended that I paint the cabinets white around my refrigerator and to move the stovetop to the other location. I totally agreed with her. She even gave me some great ideas to think about that I hadn’t considered before such as doing my upper cabinets in white and the lowers in espresso to balance out the two tones and also to put a nice valance over my kitchen window. I am so glad to have had the opportunity to work with Cynthia. She truly listened to my questions and concerns, helped me to resolve my kitchen dilemma and to see other options for my kitchen. I am now on my way to getting a can of white paint! What a sweet letter! Thank you so much Juliette! I know she is going to do a fantastic job of her kitchen. 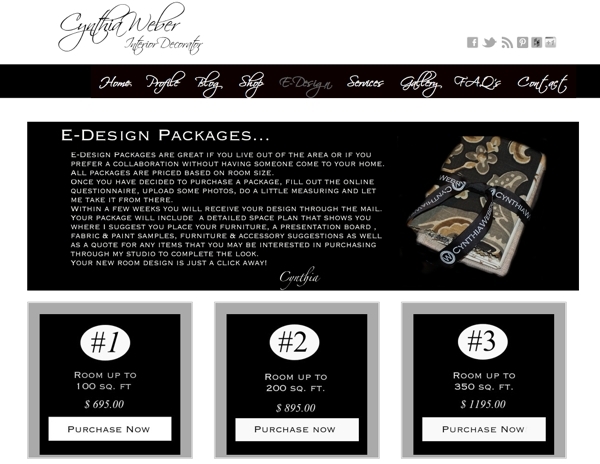 So… if this has sparked your interest in ordering an e-design package here is the 411. The large box at the top of the page will give you an overview of what you will receive when you purchase a package. Once you have decided which package you want, based on your room size, simply click “Purchase now” and you will be directed to paypal. You will also fill out a questionnaire about your room which will tell me all about you and your family, how you use your space and an idea of your tastes. The only other thing for you to do is a bit of measuring and uploading a few photos of your room. 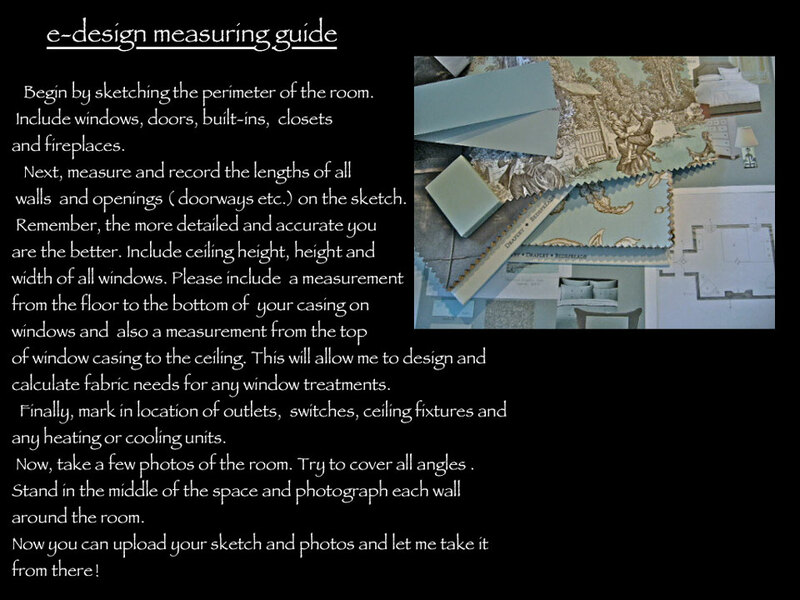 My measuring guide will walk you through how to measure for great results! 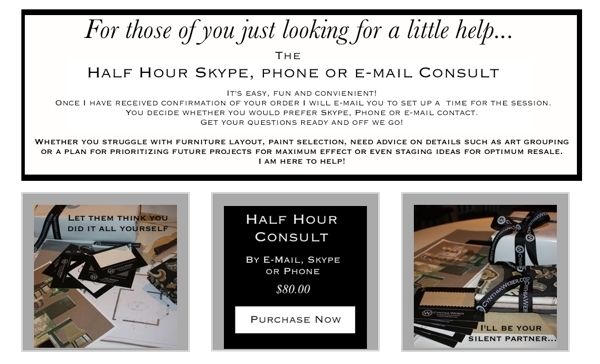 If you would prefer just a little help then the 30 minute e-design consult like the one Juliette received would be perfect . Info about that consult option is also on the e-design page right under the room packages. I hope this has given you an overview of the e-design process! I would love to be your silent partner! Lets make your home everything you want it to be! If you have been reading this post and are confused why there is no longer a link to my e-design services, I apologize! Due to the increasing demands of my client projects I found I had to eliminate this option. I am usually booked several months in advance and having people purchase e-design packages through the website at any given moment wasn’t feasible. If you are from a distance and would like to chat with me about an e-design package please email me through the contact page. Depending on your needs and if you can wait till I have an opening I may be able to take it on.